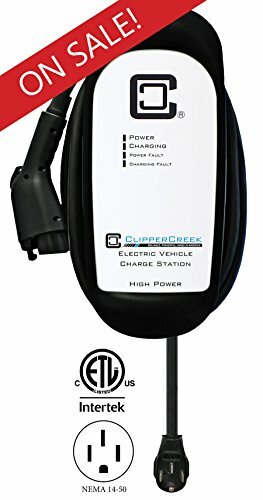 The HCS-50P Electric Vehicle Charging Station from ClipperCreek is designed to take the wear-and-tear of everyday use. Its tough NEMA 4 enclosure ensures product durability and reliability indoors and outdoors. See our Charging Times Chart in the image gallery for approximate time to charge from empty to full with for all electric cars. Please refer to the Help Section of our STOREFRONT to view our return policy, etc. FASTER CHARGING SPEEDS: The HCS-50P high-powered, Level 2 EV Charging Station EVSE - charges your car up to nearly 7x faster than the cordset that came with your electric vehicle. It is a plug-in (NEMA 14-50) car charger and works with ALL electric cars. 40 Amps of power (9.6kW) is perfect for plug-in electric vehicles like the Nissan Leaf, Chevy Bolt, and BMW i3. This high-power charging station is perfect for future-proofing! EASIEST INSTALLATION: We've made charging your car as easy as charging your mobile devices. ClipperCreek EV charging stations need no assembly - just plug in to your existing NEMA 14-50 receptacle or install a 14-50R 220V-240V socket, plug in the HCS-50P, and you're done!